To view more pictures, interactive maps and the full, detailed description of the Portlock Square community, please Login. Getting a new home can be simple. New construction properties in Portlock Square are ideal for townhouse buyers who don't want to sacrifice classy living in order to spare costs. These affordable units offer stylish designs both inside and out that appeal to a wide variety of personal tastes. Every savvy homebuyer knows that value is one of the most important elements when it comes to purchasing real estate and that's precisely why such buyers flock to this complex. 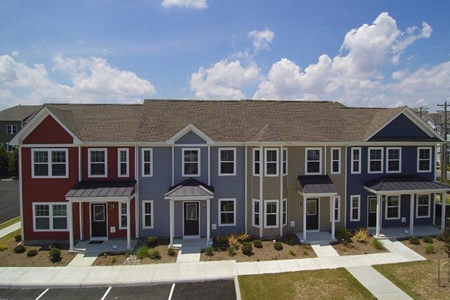 Located near SoNo, or South Norfolk, in the Portlock area of Chesapeake, VA, this development allows residents easy access to interstates, tunnels and bridges. Military members can quickly commute to Naval Station Norfolk, Naval Medical Center Portsmouth and Norfolk Naval Shipyard. Each new construction townhouse at Portlock Square can accommodate families or couples perfectly. Owners with children may like knowing their new homes are not far from local schools. Portlock Primary, George Washington Carver Intermediate, Oscar Smith Middle and Oscar Smith High serve these properties. Buyers who choose properties within Portlock Square can select between exterior and interior floor plans. The exterior townhouse only shares one wall, as it is on the end and the interior unit shares two walls, as it is nestled directly between two other townhomes. Each new home comes with a standard one-year warranty from the builder, which helps puts any worries to rest. Living in this area of Virginia can be exciting for homeowners. Chesapeake offers much in the way of recreation, shopping and entertainment. Come check out these new construction townhomes and enjoy the good life for less. Send me more information about the Portlock Square new home community. Our agents gladly offer FREE property tours of Portlock Square, Chesapeake and homebuyer consultations to all serious buyers.